The variety of "wild game" sampled -- pre-cooking. Photo by Paul Ross. When people travel, they often seek out peak dining experiences: great restaurants in exotic locales. When our correspondent Judie Fein went to Thailand, she checked into the very tony, new JW Marriott Resort and Spa on Phuket island. They have 5 gourmet restaurants, but Judie wanted to sample something off the menu -- some, uh, real local cuisine. Judie: Anthony, so what do we have on our late-night menu tonight? Anthony: We've got the ones in season at this time: the bamboo worm, the patanka bug, the mong plat bug...it's a large beetle. In English, it's called a scarab. Also, grasshopper, crickets, a few silk worms. That's Anthony Tuttle, the executive chef of the resort. It's late at night, the restaurants are closed, and the chef is giving my husband and me a private tasting. I'd heard that Thai people snack on bugs, and I asked -- OK, let's be frank -- I dared Anthony to cook some for me and my husband. Worse than that, I also dared him to eat them. Anthony: Yeah. I think, unfortunately, tonight's the night. Anthony is American, and although he's a great sport about doing this, it's obvious he's weirded-out by the bodies of dead insects that are lying in beautiful ceramic bowls in the impeccable, stainless-steel kitchen. Antony's gathered four sous chefs to teach him how to cook the bugs. Anthony begins by putting oil in a pan and then he lifts up a gross black thing with legs. Judie: Can you describe what the bugs look like? Anthony: It's like a large beetle. Judie: Let's get specific. How big? Anthony: A silver dollar, or half dollar. Mon dong means falling bug. They're so big, they come down and pelt you. If they hit you on the head, you know it. Because they're so big and cumbersome, they smack into windows and lights, and fall on the ground. When I ask Anthony how he got the bugs, his answer is rather surprising. Anthony: Last night, we had a songkran festival out along our pool. My sons and my wife actually came and I asked them to collect the bugs for tonight. I gave them a small cup and had them hunt for the bugs. Judie: Did the guests know what was going on? The upscale guests? Anthony: I hope not. I don't want them thinking that it's going to be in their food in some form. Hopefully, the guests don't know what we were doing. One of Anthony's sous chefs, Koon Jam Pon, is a real aficionado of edible Thai insects. He tells us his very scientific method for gathering them. Koon: We catch it, put it in a plastic bag, take it home -- very good, good taste for the snack, like a canapé. Koon Jam Pon tells us that real bug gourmets don't eat just any old mon dong bugs. There's a big difference in taste between male and female beetles. Koon: The female bug is nice, tasty because it has the eggs inside. It tastes like cheese. The men are only the shell with nothing inside. Judie: There are many women who feel that way about men. There's nothing fancy about the way Anthony fries these horrors. He picks up a fistful and drops them into a basket in a deep fryer. Anthony: You fry them until they float and are crunchy on the outside, and warm and juicy on the inside. As soon as the scarabs are finished, the chef starts to prepare the patanka bug -- the grasshopper. Anthony is careful to cook each insect separately, according to the wishes of his Thai staff. He consults with them throughout the preparation. Koon Jam Pon tells me and my husband that we are very lucky because we are visiting Thailand during his favorite time of the year: prime bug season. This is when they're all just aching to be caught and fried. Judie: You wait for it all year? Anthony: It's like waiting for Christmas for Koon Jam Pon. Judie: Do you ever dream about bugs? Although we have agreed to wait until everything is cooked before the tasting begins, I catch Koon Jam Pon surreptitiously popping a worm into his mouth. I ask him why he jumped the gun. Koon: I really excited. I hungry -- my stomach is all dancing now. When all the "creepy crawlies" are fried, Koon Jam Pon does the initial tasting of a large mon dong, pretty much the way a wine expert would savor the first sip. Koon: Mmmmmm. Nice taste. You forget spaghetti and you forget steak if you try this one. Excellent. Then Anthony, who must be the best-humored chef in the world, makes good on his dare. He is also going to taste a beetle. Anthony: Should I eat it tail first or head first? Anthony: Actually, it's not bad. I don't know if I'd have it every night but it's not a bad taste, really. Now, Anthony tries a grasshopper. Anthony: Uh, uh -- I can't do this one. Judie: The chef is spitting up here. Anthony: Blecch..the grasshopper...I cannot do -- it's too big. I may be able to eat that on after 12 beers. OK, he can't croak down a grasshopper. Maybe he'll do better with a silk worm. Judie: You're spitting it out. Anthony: Ugh, it's bitter. It's fatter, there's too much worm. It's too gooey inside. It's not my cup of tea. Just as I'm making fun of Anthony and Koon Jam Pon, they turn on me. Now, it's my turn to take the dare. Judie: Which one would you suggest I eat? Anthony: Try the small cricket. We've put a little salt and pepper on them and tossed with a little Magi sauce. Judie: How should I do this? Anthony: Close your eyes. Think you're eating bar snacks: peanuts at the bar. Don't think it's a bug. My husband Paul has an even wilder idea. Paul: Think of it as a cashew with legs and an antenna. Judie: I can't do this. The head -- I can't do the eyes. I can taste the eyes. I gotta get this out. I am feeling like a bit of a failure. Anthony: It's a guy thing, then. All of us are eating them. It seems that this is true. It is a guy thing. Koon Jam Pon tells us his wife would never eat a bug, and neither would most of the Thai women he knows. Now, there is only one guy left in our group who hasn't tried an insect: my husband Paul. The dare is thrown to him. And, he goes for a really gross mon dong bug. Paul: The other night I was trying to eat dinner and these things were flying at me, eating me. So, now, I'm gonna eat one of them. This is revenge. 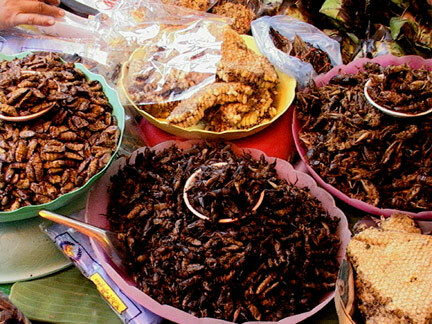 Comestible crawlies at an indigenous marketplace in Bangkok, Thailand. Photo by Paul Ross. So, the next time you're in Thailand, will you take the dare? And, what'll it be? Silkworms? Crickets? Beetles? If you can't hack bugs, luckily, you're in a country with some of the best and most affordable food imaginable -- and it doesn't come flying off the walls or hit you in the head when you least expect it. In Phuket, this is Judie Fein for The Savvy Traveler.